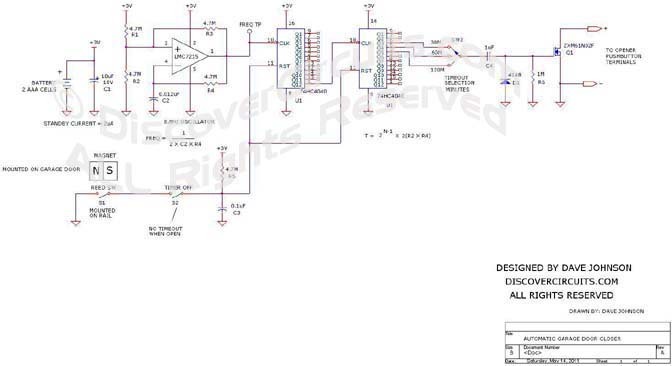 The circuit below is designed to automatically close a garage door, if it was left open for a long period of time. 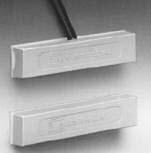 A reed relay and magnet combination sense when the door is fully open. An ultra low power voltage comparator oscillator and two 74HC4040 ICs are used to generate the time delay. A jumper or a switch can be used to select a time of 30 minutes, one hour or two hours. The circuit draws only about 2ua so a pair of AA alkaline cells would keep the unit running for many years.